The 1850s were a turbulent time in American history. For African-Americans—freed and enslaved—the decade was marked by great achievements as well as setbacks. For instance, several states established personal liberty laws to counter the negative impact of the Fugitive Slave Law of 1850. However, to counter these personal liberty laws, southern states such as Virginia established slave codes that hindered the movement of enslaved African-Americans in urban environments. 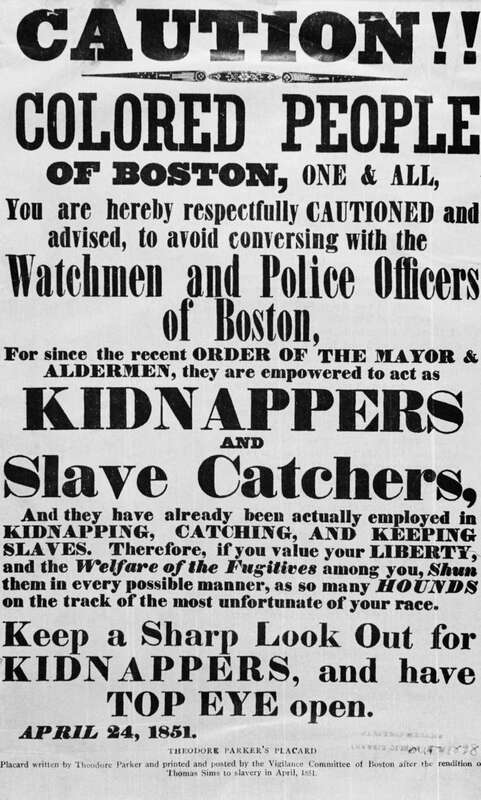 The Fugitive Slave Law is established and enforced by the United States federal government. The law honors the rights of slave owners, placing fear in both fugitives and freed African-Americans throughout the United States. As a result, many states begin passing personal liberty laws. Virginia passes a law forcing freed slaves to leave the state within one year of their emancipation. Shadrack Minkins and Anthony Burns, both fugitive slaves, are captured through the Fugitive Slave Law. However, through the work of attorney Robert Morris Sr and several abolition organizations, both men were freed from enslavement. Sojourner Truth delivers "Ain't I A Woman" at the Women's Rights Convention in Akron, Ohio. Abolitionist Harriet Beecher Stowe publishes her novel, Uncle Tom's Cabin. William Wells Brown becomes the first African-American to publish a novel. The book, titled CLOTEL is published in London. The Kansas-Nebraska Act establishes the territories of Kansas and Nebraska. This act allows the status (free or slave) of each state to be decided by popular vote. In addition, the act abolishes the anti-slavery clause found in the Missouri Compromise. States such as Connecticut, Maine, and Mississippi establish personal liberty laws. States such as Massachusetts and Rhode Island renew their laws. States such as Georgia and Tennessee remove binding laws on interstate slave trade. John Mercer Langston becomes the first African-American elected to serve in United States' government following his election in Ohio. His grandson, Langston Hughes will become one of the most celebrated writers in American history during the 1920s. The Republican Party is established out of the Free Soil Party. The Free Soil Party was a small yet influential political party that was in opposition to the expansion of enslavement in territories owned by the United States. Groups supporting slavery attack Kansas' free soil town, Lawrence. Abolitionist John Brown responds to the attack in an event known as "Bleeding Kansas." The United States Supreme Court rules in the Dred Scott v. Sanford case that African-Americans—freed and enslaved—are not citizens of the United States. The case also denied Congress the ability to curtail slavery in new territories. New Hampshire and Vermont mandate that no one in these states is to be denied citizenship based on their descent. Vermont also abolishes the law against African-Americans enlisting in the state army. Virginia passes a slave code that makes it illegal to hire slaves and restricts the movement of slaves in certain parts of Richmond. The law also prohibits slaves from smoking, carrying canes and standing on sidewalks. Ohio and Wisconsin also pass personal liberty laws. Vermont follows suit of other states and passes a personal liberty law. The state also says that citizenship will be granted to African-Americans. Kansas enters the United States as a free state. Following in the footsteps of William Wells Brown, Harriet E. Wilson becomes the first African-American novelist to publish in the United States. Wilson's novel is entitled Our Nig. New Mexico establishes a slave code. Arizona passes a law declaring that all freed African-Americans will become slaves on the first day of the new year. The last slave ship to transporting enslaved people arrives in Mobile Bay, Ala.
John Brown leads the Harper's Ferry raid in Virginia.